Hull Ionians lost their second match on the spin as they were beaten by Stourbridge in Round 20 of National Two North. The league leaders are now just two points clear of the chasing pack as Chester, Huddersfield and Fylde all picked up victories on Saturday. Second-placed Chester defeated Peterborough Lions while wins over Sheffield Tigers and Tynedale for Huddersfield and Fylde means the battle for promotion has sparked into life. Fifth-placed Otley remain on the cusp of the leading group after beating Macclesfield, but Hinckley’s hopes of a top two finish suffered a setback as they were beaten by South Leicester. The victory for South has boosted their own survival hopes as they are now eight points from safety while elsewhere, Leicester Lions and Wharfedale both came from behind to clinch victories over Sedgley Park and Preston Grasshoppers, respectively. 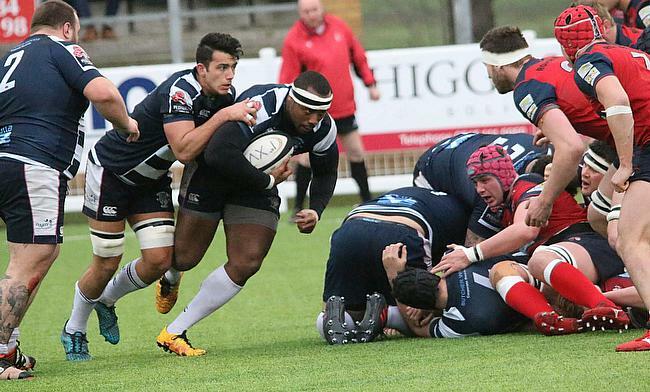 Hull Ionians fell to their second defeat in a row as the league leaders lost to Stourbridge in the Midlands. A Sam Montieri try, converted by Chris Scott, gave the hosts a 7-0 lead but Lewis Minikin replied with a penalty before the interval. There’s some big games coming up ?? After the break, the table toppers then proceeded to camp themselves in the Stour half and despite waves of pressure, the hosts came up with the answers in the form of a remarkable defensive effort. The victory for Stourbridge was a great response following their loss to Hinckley in Round 19 while the I’s are now only two points clear at the summit after another away defeat. Chester capitalised on Hull Ionians’ misfortune as they beat Peterborough Lions to cut the gap at the top of National Two North. Jan van Deventer’s side recorded their 10th home victory of the campaign and they are now just two points behind the leaders as the title race has opened up. Tries from David Ford, Andrew Oakden and Shay Owen put Chester 17-5 ahead at half-time, with Marius Andrijauskas scoring for Peterborough Lions. The Lions hopes of a potential fightback faded when Michael Craven crossed for Chester soon after the restart and that proved to be enough for the promotion chasing hosts. Defeat for Peterborough Lions, who sit bottom of the division, now leaves them 22 points from safety with a game in hand. Huddersfield claimed their fifth victory in a row as they secured a bonus-point win over Sheffield Tigers. The latest triumph for Field not only keeps them in the promotion hunt, but they are now just four points behind leaders Hull Ionians with a game in hand. Tries from Matt Dunn, Richard Piper, Chris Johnson and Harry Whitfield gave Huddersfield a 26-14 lead at half-time, while Will Bennett and Thomas Taylor-Dawes crossed for the Tigers. The hosts added a further score late in the second half via Lewis Workman as Field’s excellent form continued. Fylde returned to winning ways at the first time of asking after an impressive bonus-point victory over Tynedale at Woodlands. Morgan Passman scored the opening try for Tynedale, but that was as good as it got for Ben Woods’ side. Tom Carleton and Greg Smith touched down as Fylde led 17-5 at half-time, with the latter also landing a penalty. Connor Wilkinson nipped in for Fylde’s third score after the break before the home side were awarded a penalty try on 62 minutes. As conditions worsened in Lancashire, Fylde were able to manage the remainder of the game to clinch the victory which leaves them just five points behind league leaders Hull Ionians. Otley bounced back from their defeat against Preston Grasshoppers in Round 19 by beating Macclesfield in a brilliant contest at Cross Green. The Yorkshire outfit remain 10 points behind second-placed Chester following this victory while Macc are 18 points adrift of safety with a third of the season left to play. The away side were left facing an uphill task when they conceded two early tries as Declan Dunn and Ben Magee both crashed over. Joe Graham and a brace from Alex Beaumont gave Otley a commanding 31-0 lead at half-time. However, Macclesfield sparked into life following the restart as Myles Hall, Dafydd Rees and Harry Blackwell all touched down to reduce the deficit to 15 points. But, Otley surged clear once again as Magee grabbed his second try before Beaumont scored twice more to wrap up the win for the hosts. Macc did have the final say as Blackwell crossed again, but the Blues slipped to their fifth defeat in a row. South Leicester are now eight points from safety in National Two North as they picked up a potentially vital victory over Hinckley in a thrilling game. After James Neal and Aaron Phillip scored early tries for both sides, Callum Dacey’s effort and a penalty from Joe Wilson put Hinckley 15-11 ahead. Wilson nudged the Hornets further in front after half-time, but Matt Cooke and Javiah Pohe went over either side of the hour to put South 23-18 up. With six minutes remaining, Hinckley thought they had sealed the win when Oli Povoas gave them the advantage once again, but Reece Harris snatched a thrilling bonus-point victory for South right at the death. Leicester Lions recovered from an 11-point deficit to beat Sedgley Park for the second time this season. Tries from Andy Riley (2) and Connor James gave Sedge their 19-8 first-half lead, with Dan Ali crossing for the Lions. But three penalties from Dan Lewis in the final quarter of the contest set-up a dramatic finish at Park Lane. The Lions were awarded a late penalty and opted for the sticks. Lewis lined up another kick at goal, but when he took his run up, the ball dropped off the tee. He then picked up the ball off the floor and slotted a drop-kick from about 40m out to clinch a remarkable victory for the Lions. A second-half turnaround saw Wharfedale build on last week’s victory over league leaders Hull Ionians as they beat Preston Grasshoppers. James Gough and Ryan Carlson scored for the hosts before half-time as the Hoppers led 14-0, but Dale clicked into gear after the interval. Jack Blakeney-Edwards landed a penalty before two quick tries from Sam Gaudie and Harry Bullough proved to be enough for Dale as they clinched the win in a contest that also saw six yellow cards dished out over the course of the 80 minutes.